Sales of CJ’s books will also help fund her not-for-profit organization, Seserys (“Sisters”), educates people in imperiled communities to claim their power and defend themselves against spiritual, emotional, physical, and sexual brutality. From tips on how to “fail” the predator interview and avoid being targeted, to instructions on using your personal bodily “weapons” to defend yourself in a confrontation, CJ Scarlet offers everything you need to know to stay safe, fight if you must, and navigate the criminal justice process if the worst happens. If you read just one book on personal safety and self-defense in your lifetime, The Badass Girl’s Guide is the one for you! Click here to read an excerpt from The Badass Girl’s Guide. “Your book, The Badass Girl’s Guide, is one of the most revolutionary books I have ever read. It turns old beliefs about gender norms and violence on it’s head and gives women new tools and rules of the road. I am so proud to know you and look forward to working with you. What a brave and brilliant response to sexual assault and violence. Girls be confident, stay alert. Ear buds out/off your cell phone, stay sober and fight back until you can run away. “I’m reading my own copy now-and just ordered one for each of my nieces in college. Setting and knowing your boundaries–trusting your intuition-protecting yourself and feeling completely solid within–ALL so essential to LIVING–but not many of us are taught. We’re just not equipped. Sheltering children from even hearing about certain dangers–and dangerous people–they’re left so vulnerable and completely unprepared. CJ will be pivotal in changing all of this! A Must Read — It Could be a Lifesaver! “CJ Scarlet has given a gift to her readers and their loved ones. In this tightly and well-written guide, she raises the awareness of readers to the dangers of their contexts and what to do about it. With just the right tone, Scarlet shares real-life threats and real-life practical initiatives and responses that people can take. This book covers all the bases to give readers a head’s up and an edge against predators they may face. She draws on a wide spectrum of resources and experience to write a substantive book that confronts readers’ misinformation, faulty internal scripts, naivete and ruts that victims may be stuck in. This is The Badass Girl’s Guide, and I think it is a must-read for girls. For girls under ten, it might be something that parents read and then convey the highlights to the girls until they are more mature; however, I think this is important information for girls to get asap. I also think boys and men should read this, especially boys who themselves are often targets of predators. Men can learn a lot here about how to interact with women and how to train up their daughters and to help their wives to stay safe. Scarlet shares plenty of information that is generally helpful to all genders of readers on staying safe and reacting smartly to threats. I’m fairly sure that most readers will have a response similar to mine after completing this book and that is that you want many people you know to read it immediately. “In the past, it was not uncommon to hear statements like, “If you don’t want to be sexually assaulted, make sure you dress well. Don’t wear short skirts or dresses with plunging necklines and don’t flirt with men,” etcetera. Two things happened, however, to put paid to that line of reasoning. First, research based on available data revealed that sexual assault was not limited to women who dressed provocatively or engaged in flirtatious behaviour. Conservative women also reported cases of sexual assault. Second, women’s rights groups insisted on the right of women to dress as they pleased without fear of molestation, and the onus fell on men to keep their hands,[if not their eyes] to themselves. This point has been a bone of contention in many sexual assault cases. Does a woman’s choice of outfit or social behaviour determine if she gets assaulted or not? Assuming it does, why are there cases of sexual assault even in places where women wear burqas? These are tough questions indeed, but whatever the case may be, this week’s book by CJ Scarlet titled The Badass Girl’s Guide; Uncommon Strategies to Outwit Predators, contains practical tips for outwitting sexual predators. In this guidebook, CJ discusses myths and facts about sexual assault and describes the types of predators. She also highlights five possible responses to sexual assault; Freeze, Fawn, Comply, Flee or Fight and is careful to point out how each can be used to advantage. Reading this book for me was like inhaling fresh air; in fact at a point I found myself exhaling. At last! Here’s someone who is real and not idealistic. No locker room advice is given here [‘carry pepper spray in your bag at all times’], rather, readers are treated to sound advice such as the role of intuition and situational awareness in preventing sexual assault, as well as tips for outsmarting a would-be predator. 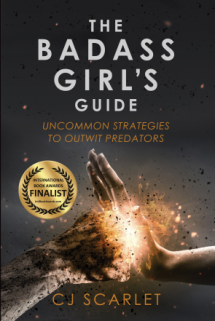 “The Badass Girl’s Guide: Uncommon Strategies to Outwit Predators is a self-help book teaching the reader how to deal with uncomfortable situations such as out thinking and out playing a criminal predator. It covers ways to navigate the criminal justice system and how to deal with trauma, after being victimized. The moment I began reading this book, it reminded me of the Cleveland Victims and how their predator had abducted them, keeping them trapped in his home over 10 years before one of them managed to escape, saving the rest. I believe as a woman, or even as a human being, knowing what to do or not to do in certain hostile cases, it is very beneficial to have read this book. Of course, not every situation and circumstance can prepare you for what could happen but at least knowing the basics of certain aspects may actually save your life. For that reason, I believe this book was very useful and is much needed. The literature was easy to understand, and the subject matters were divided into an organized format in order to make it easy to follow through. I particularly enjoyed the part where the author teaches you how to confront a predator. Sometimes, in such situations, the brain just freezes and knowing from all the interviews and books I have read on such victims, everything learned is quickly forgotten. Therefore, let’s hope that none of us have to go through this regardless of what we do know or wish to learn. When Dylan, an average wave of middling ability, realizes he’s about to crash on the shore, he’s terrified and miserable. But when he encounters a magnificent wave named Serena, Dylan learns that he is not separate and alone, but One with every wave and every creature in the ocean. In fact, Dylan learns that he is the ocean itself! In the process, he discovers that courage is found in the eye of the storm, that the limitless abundance of the universe is always within our grasp, that it is through focusing on the happiness of others that one’s own happiness is achieved, that we truly do possess the power to make our dreams come true, and that although we appear to be separate from one another, we are collective drops that together form the same vast ocean. Neptune’s Gift is sprinkled with colorful sea creature characters that help illuminate and reinforce the lessons Dylan learns on his voyage of the spirit. Abounding with thoughtful ideas for readers to consider and apply directly to their lives, this profound and fun allegorical tale will leave readers touched and inspired, as they travel with Dylan on the greatest journey of his life. 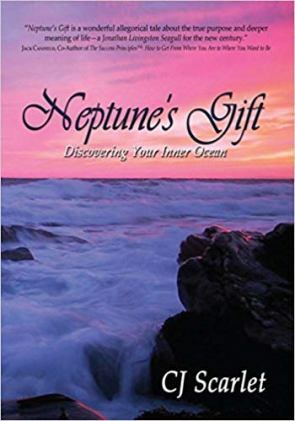 Neptune’s Gift is perfect for spiritual seekers, and children of all ages and their parents who want to expose them to some of life’s most important lessons about managing fear, riding out the storms of life, and finding genuine happiness. 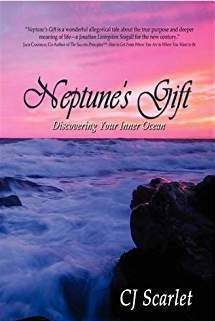 To order Neptune’s Gift: Discovering Your Inner Ocean by CJ Scarlet, visit Amazon.com or click here.